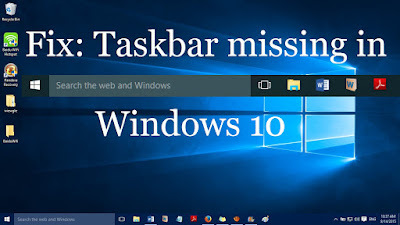 Wondering on how to solve your windows 10 taskbar error? You’ve got no cause to worry about anything. I’m here to give you the steps to take in order to solve your task bar not working error in windows 10. But before I proceed, i would like to let us know what I actually meant by task bar. Taskbar can simply be defined as an element of a graphical user interface that consists of many bases. Taskbar shows the current program you run on your device and also give its link. Most operating systems has different ways of designing their taskbars. For example taskbar doesn't work windows 10, windows 10 taskbar not showing windows operating system Taskbar is different from iOS Taskbars. There are lots of ways to fix a malfunctioning taskbar. And here I will be given the most effective method and easiest method to solve your malfunctioning unclickable taskbar windows 10. Restart windows explorer: First and foremost, restart the windows explorer in order to repair your taskbar if the issue is not out of hand. The processes tab will appear, scroll down and click on windows explorer under the processes tab. Hit the restart button under window explorer and there you go. By restarting your windows explorer you will at some extent repair windows 10 start menu and taskbar not working issue. Disable addons: You can disable addons by booting your windows 10 computer. A times file explorer addon might be interfering with a well-functioning explorer. Use windows powershell: If after trying the above steps and the problem still persist, you just have to register the taskbar again. This method can be followed so as to fix the taskbar malfunctioning issue by using Windows Powershell. Click “yes” in the next windows page. A program which needs to be executed will appear on the screen. On the appeared screen, you will have to complete the program. Once you are done executing the program, you can now move to the next step by filling some directory in explorer. Locate Tile data layer by scrolling down. Immediately you get this folder make sure you delete bit instantly. After doing this, check if your taskbar is now working perfectly as expected. By following the above steps, you can be able to fix taskbar not responding windows 10. Just choose any of the methods stated above and you will be free from your taskbar malfunction. I hope you find this article helpful, by now I hope you can now fix your taskbar not working problem on windows 10. Thanks for going through the article, stay tuned for more helpful tips by GadgetSpirit. Until next time, stay blessed.